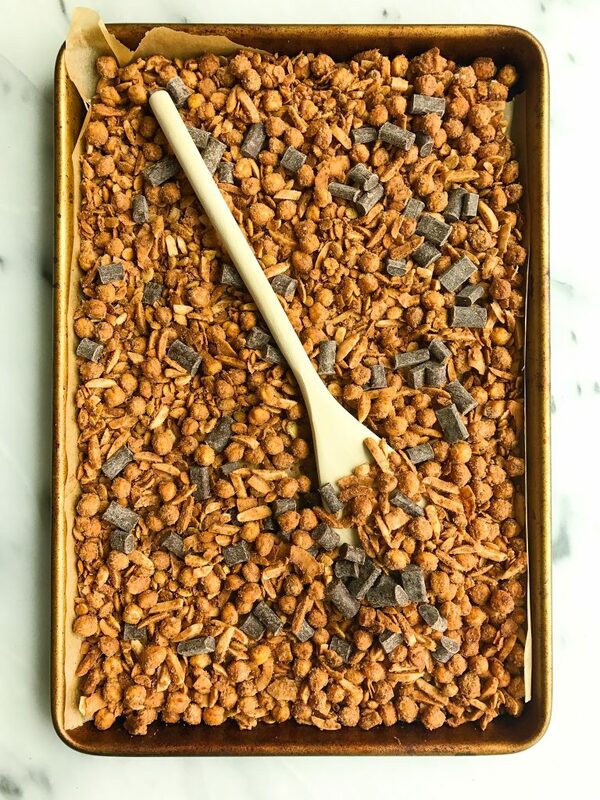 Deliciously easy Dark Chocolate Sea Salt Grain-free Chickpea Granola made with no added sugar! It is no shock to anyone after seeing my Instagram account and watching my daily stories that I am granola OBSESSED. I have over 16 types of granola currently in my kitchen. And yes, I love each and everyone equally. I like having a mix of grain-based granola, grain-free granolas, etc. on hand. That way I can switch things up easily and really never get bored. I have buckwheat granolas, oat granolas, nut-based granolas and I keep them either in the fridge or the pantry. 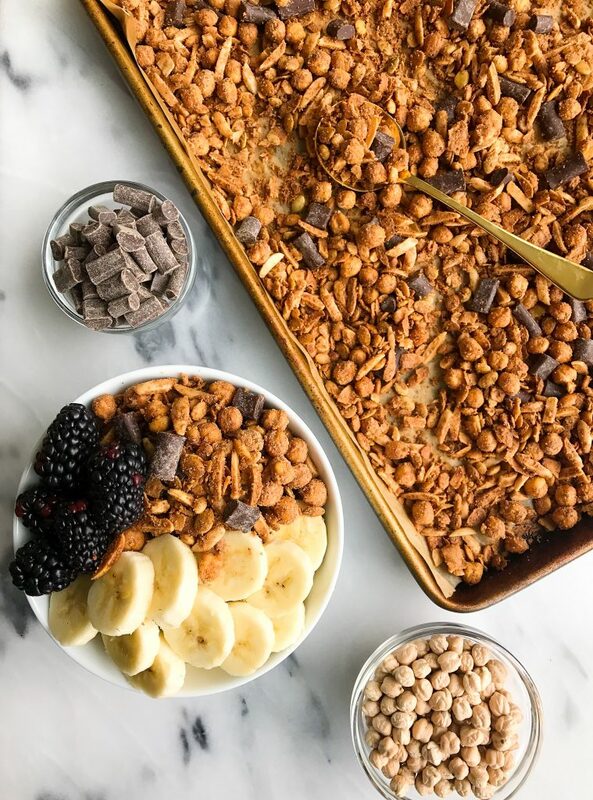 I personally prefer to store all granola in the fridge after it has been opened since the ones I eat are made with such simple and fresh ingredients, they tend to go bad quickly. I also live for a granola with a crunch and the coldness ensures that crunchy texture. One type of granola I have never in my life seen or heard of is chickpea granola. Which to be honest, is pretty shocking to me since roasted chickpeas are all the rage. I am all about them chickpeas and eat different sources of them everyday from hummus to roasted ones to making chickpea salads or falafel burgers. It is a solid bang for your buck when you eat chickpeas too. Pulses in general (basically chickpeas, dry peas, lentils, beans) are delicious, protein-packed, sustainable foods. I love the added fiber and protein I get from eating pulses like chickpeas and when I wasn’t eating meat, this was so key. A few months ago the Pulses team invited me to a cooking class here in NYC and we got to make the most delicious and creative recipes with a professional pulses chef. It was so amazing and cool to see how many uses there are for chickpeas and how to incorporate them in our eats. Because pulses are so nutritious, I am doing my best to eat more healthfully just be adding pulses into my diet. It is so much easier than you think to get half-cup serving of pulses into your eats. There are so many delicious recipes (like this granola) that you least expect to have beans or anything in them. Anyone remember those Brownie Truffles? Because those are still making me drool. 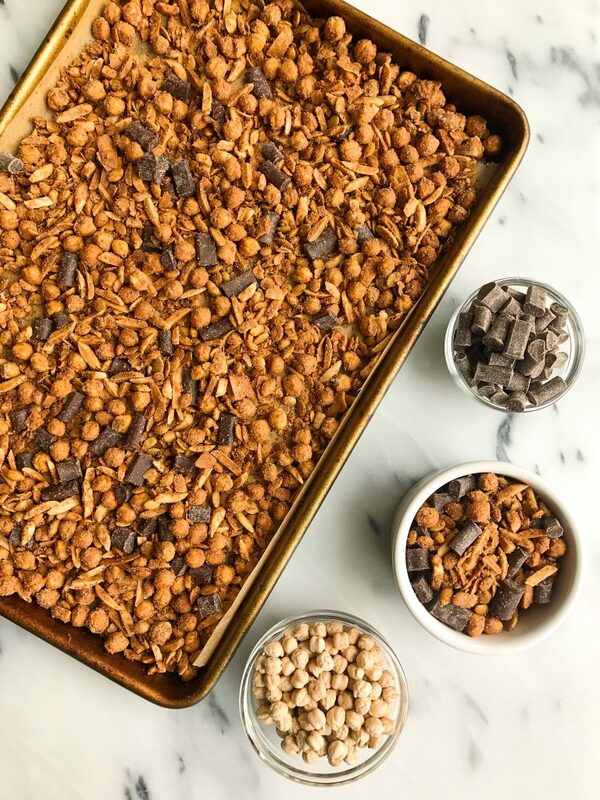 Whip them up after this Dark Chocolate Sea Salt Grain-free Chickpea Granola. The perfect mix of sweet, salty and a CRUNCH. This recipe freezes very well so since it makes a big batch, leave in fridge for a week or freezer for months! Bake about 10 minutes or so more, watching carefully as to not let it burn. Thank you USA Pulses & Pulses Canada for sponsoring this post. It means so much to me to work with brands that I love and who support rachLmansfield! This is really cool Rachel. I love how you used chickpeas. I agree that having a mix of grain free, oat granolas, nutty granolas and such is really fun; and thanks for the tip about putting it in the fridge. I want to try that now! What’s your favorite granola brand? In my oven now 😋😋😋. When do i add the second half of the cinnamon? After soaking chickpeas, did you let them dry prior to baking?